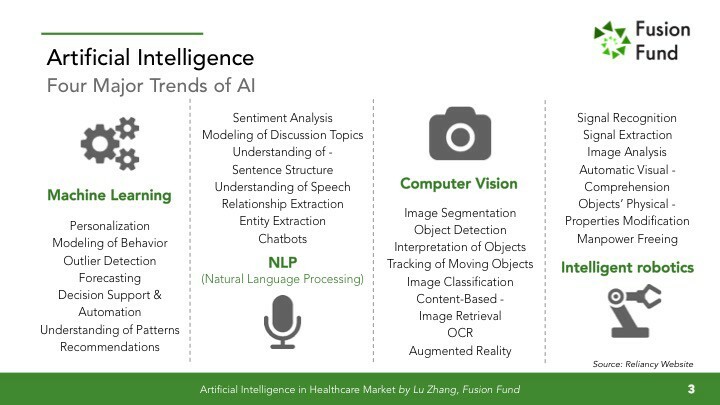 Artificial intelligence (AI) has developed rapidly in recent years. 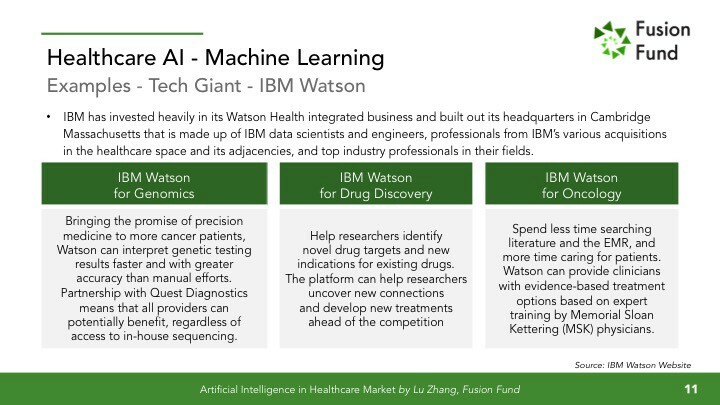 From the triumphs of AlphaGo against the world’s best Go players to the frequent appearance of intelligent robots in shopping arcades, AI has moved from the laboratory to the public arena. 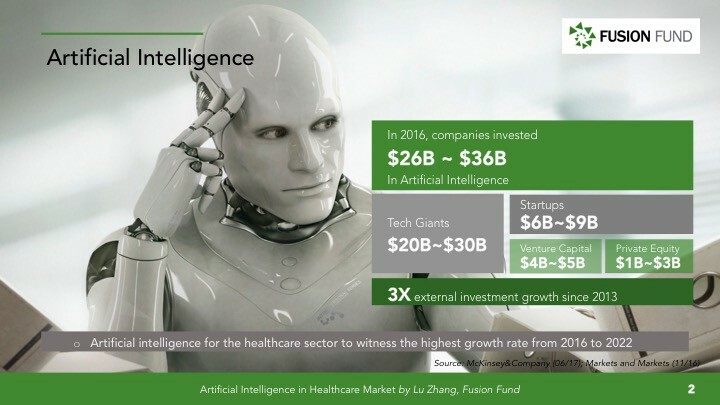 Investments into AI have been robust the last couple years. 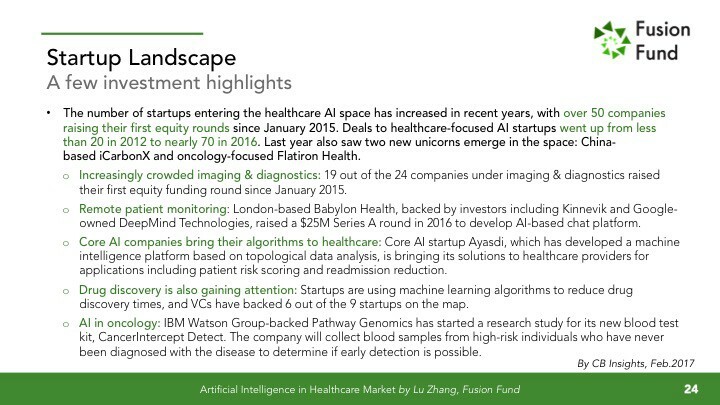 In the first and second quarter of 2017, the total VC investment into AI and machine learning companies reached $3.6B dollars, exceeding the investment volume for all of 2016. 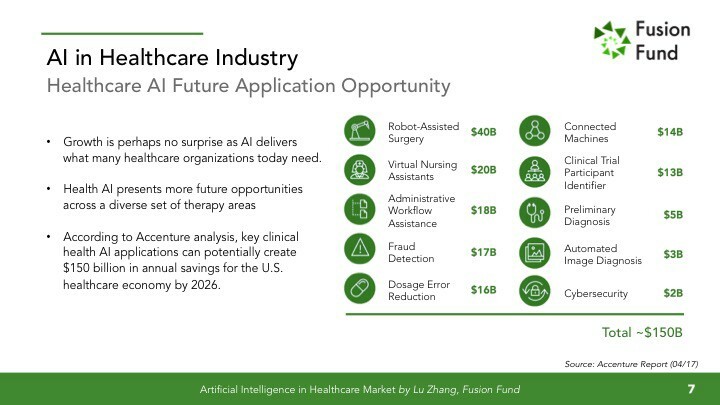 More importantly, AI’s application space has developed. 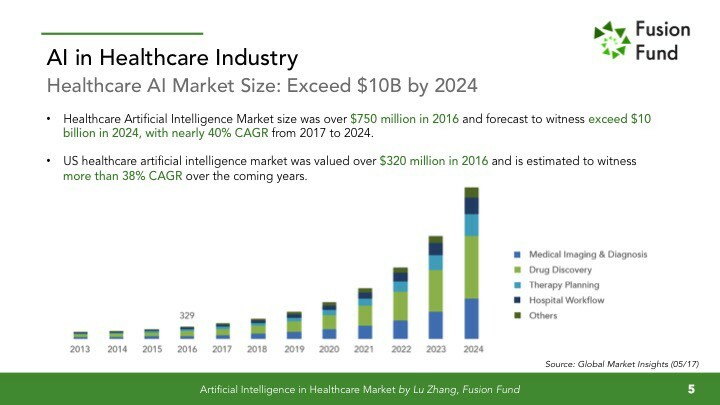 The AI market has great potential across various industry verticals such as manufacturing, retail, healthcare, agriculture and education. 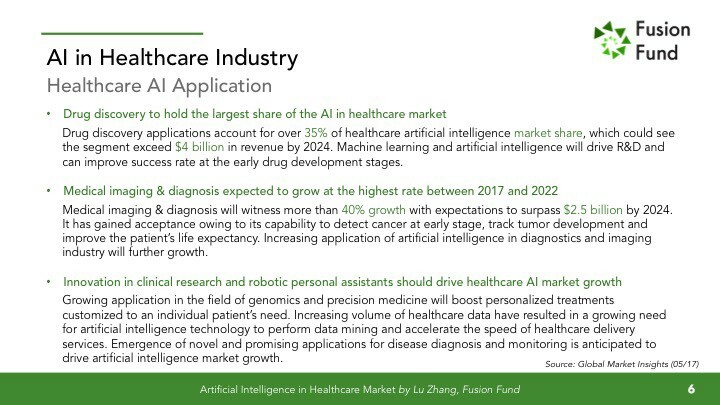 More specifically, AI applications in the healthcare space has witnessed the highest growth rate in recent years. 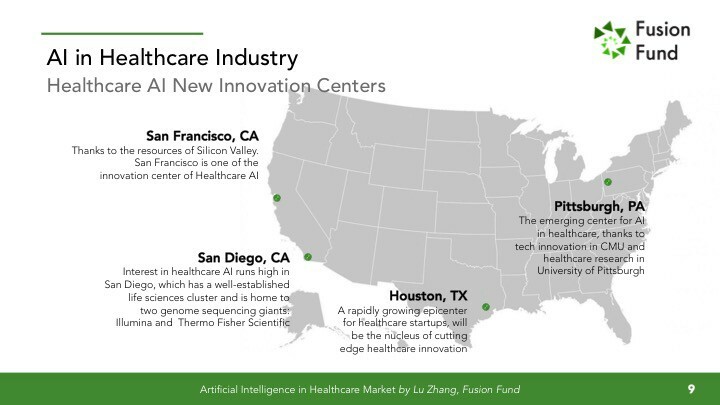 The combination of AI and healthcare is bi-directionally driven. 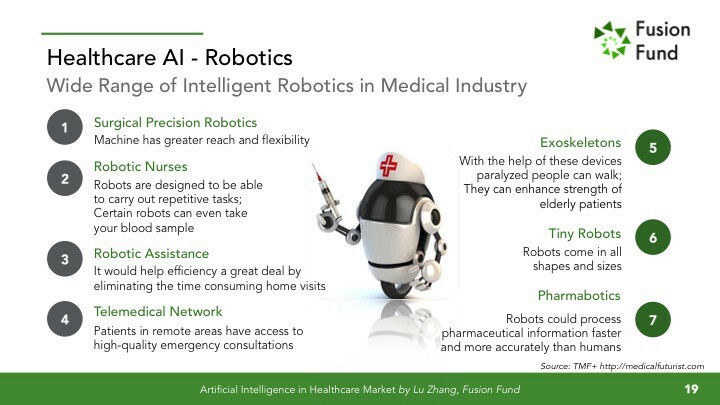 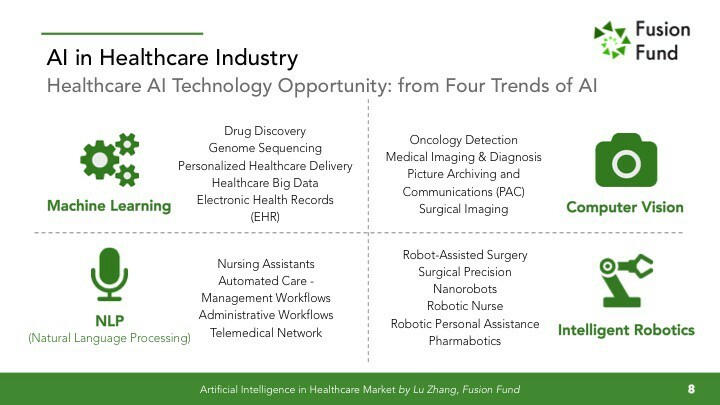 On the one hand, many AI technologies have achieved excellent commercial value in healthcare; on the other hand, innovative AI technologies have brought new opportunities to medical innovations. 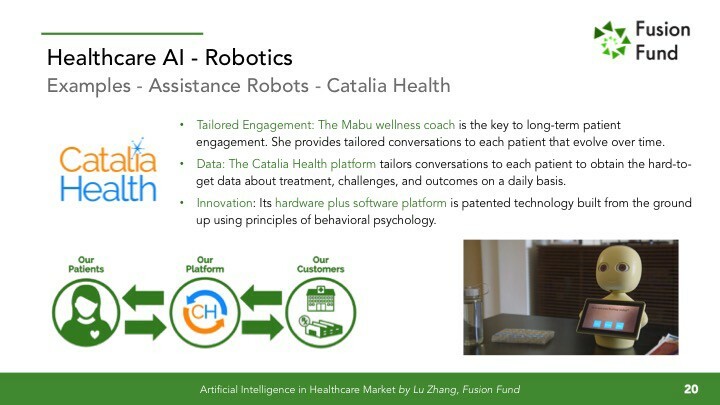 Through the integration of traditional discrete physiological information and machine learning technologies, the future trend of personalization and orientation in the medical field have become more clear. 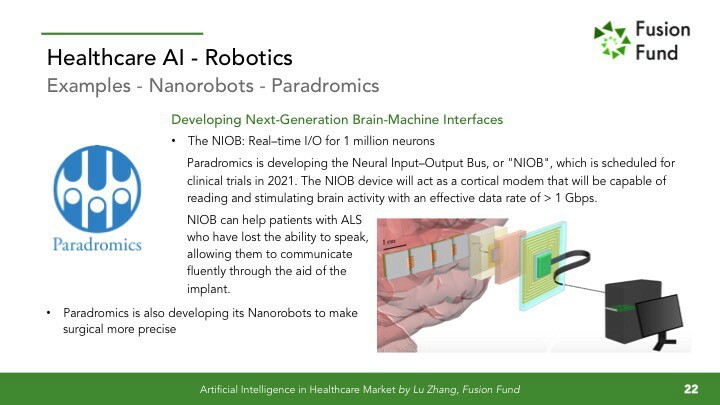 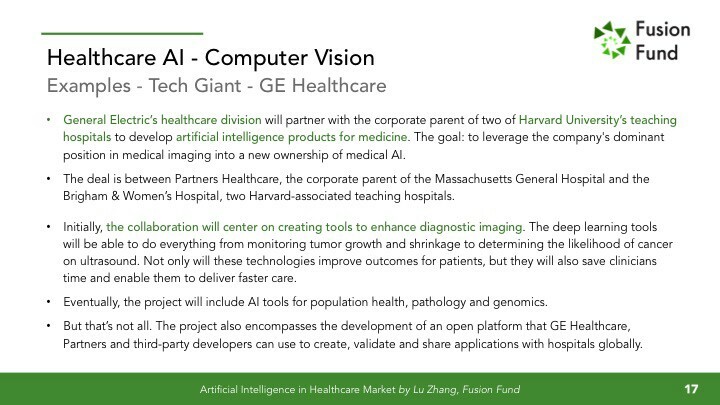 I presented this AI in Healthcare report in Sept. 2017 at a tech conference in silicon valley. 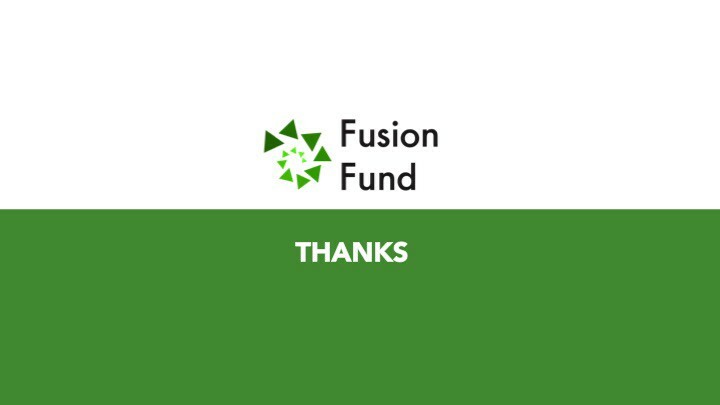 Here I would like to share the full version to the community. 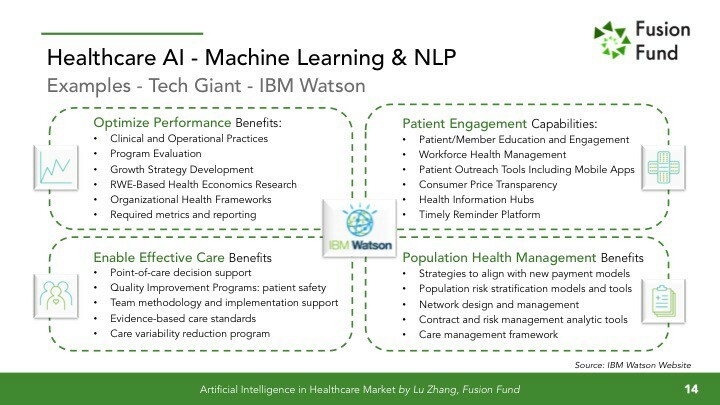 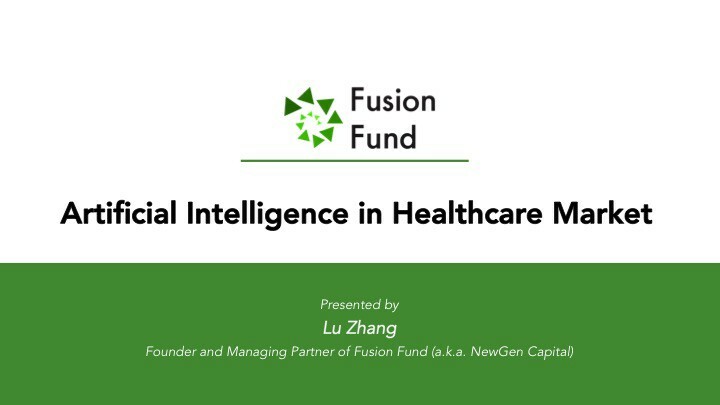 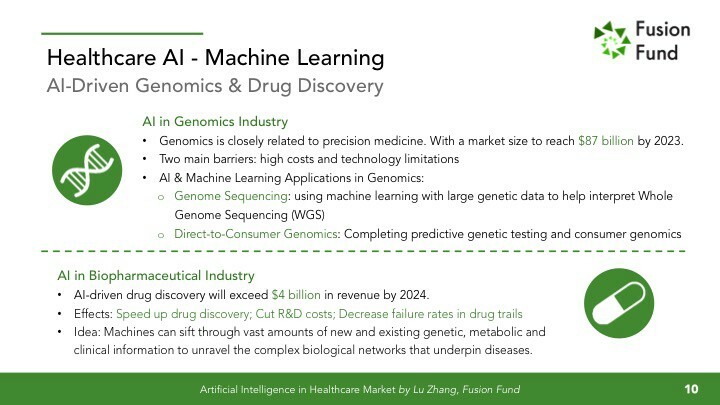 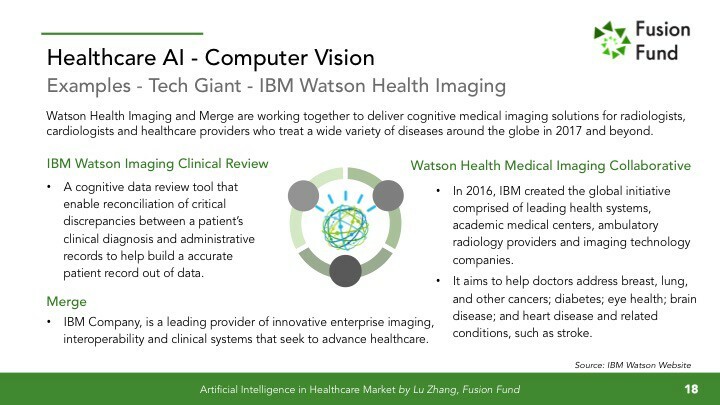 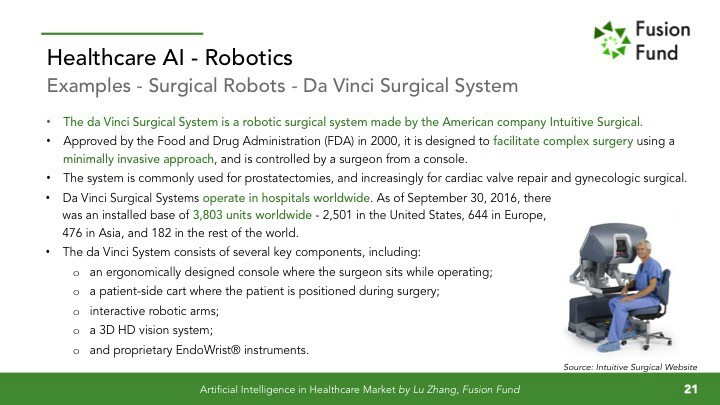 It provides some important data and information on AI in healthcare in US, including investment trends, industrial growth, major innovation centers distribution and case studies from IBM Watson, etc. 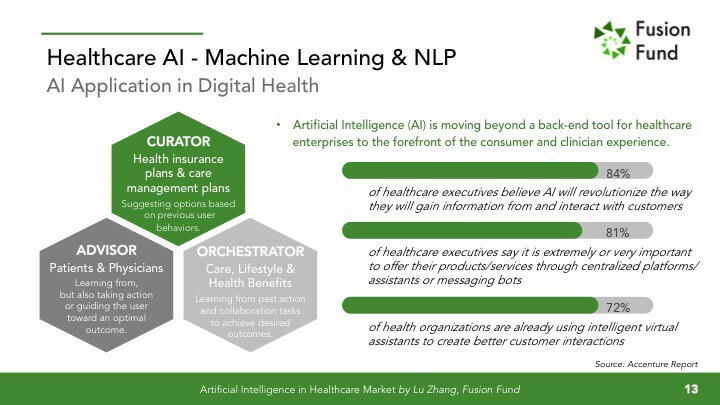 It mainly separately analyzes the application and development of the four major trends of AI in Healthcare: Machine Learning, NLP (Natural Language Processing), Computer Vision and Intelligent Robotics.